The age-old debate about which species of bass is best; a lot of that depends on where you are from but many of us in the north are often spoiled with healthy populations of both species. I’ll leave my preference until the end, but here is a case for both species. Which one would you rather chase? More widespread than the smallmouth this was probably the first species of bass you encountered. That right there should make them hold a special place in your heart. 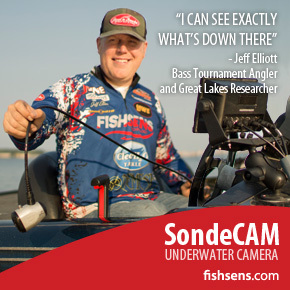 For most places in the country it’s hard to be far from a body of water with largemouth bass. One of the things that makes them great is they are so incredibly lazy and that makes them predictable. A largemouth would much rather wait for food to come to it. Laying in ambush next to some cover is the ideal situation for them. That means fishing the fun stuff like wood, docks, and thick weeds. The last time I checked it doesn’t get much better than fishing heavy cover with big baits, big rods, and heavy braided line. Did I mention that largemouth love to eat topwater frogs also? The reality with largemouth is they can be caught with so many different techniques and in such a wide variety of habitats. They are consistent and while they don’t always cooperate, you can be fairly certain that there will always be a few fish in productive areas. They don’t fight as hard as a smallmouth but other than a sometimes extremely small strike zone there aren’t many drawbacks. Stepping the classiness factor up from their green cousins is the smallmouth. When I think of smallmouth I envision clean, clear, water and not a hot weedy swamp. I also think of one of the hardest fighting freshwater fish I’ve ever dealt with. They can be incredibly aggressive or extremely finicky in nature. They prefer to feed by sight and when they are in that aggressive mood, they will travel a long way to bite whatever you have tied on. Smallmouth also love current and if you can find the current seams and ambush points the fishing can be predictable and fast-paced. However, they also happen to have a reputation for being “here today and gone tomorrow.” They will abandon the best structure in an instant if the food source leaves. This nomadic nature can make them very undependable and to be successful you have to constantly move with them. You’ll also notice on many fisheries that offer good populations of both species that the smallmouth will disappear during the hot months. Big water is another thing to be prepared for as the best smallmouth waters are typically on lakes that can get rough and dangerous. But If you have never experienced Great Lakes smallmouth fishing, it is something you must do in your lifetime. As much as I love the amazing smallmouth fishing we have in the north I still prefer the dependability and consistency of the largemouth bass. Digging them out of thick vegetation is one of my favorite ways to fish and I love to use their lazy habits against them. Also while not as aggressive as a smallmouth when spawning, I enjoy the fact that every largemouth encountered has a different personality while sight fishing for them. Let us know which species is your favorite and why. dailly andd take pleasant information from hre daily. and said “You can hear the ocean if you put this to your ear.” She placed the shell to her ear annd screamed. to go back! LoL Iknow this is completely off topic but I had to tell someone! useful information to us, kep it up. So alkow me to reword this….Thank YOU for the meal!! But yeah, thanks for spending some time to taalk about this subjet here on your site. Howdy, i read your blog freom time to time and i ownn a similar one and i wwas just curious if you get a lot of spam remarks? If so howw do you stop it, any plugin or anything you can advise? issue. I’ve tried it in two different internet browsers aand both show the same results. Thank you for the feedback, we are correcting the issue and the images should be visible within the article.